The weather is finally nice and cool here in Texas -- it's hard to believe that Thanksgiving and the busy holiday season are nearly here! If you're like me and your weeknights are short on time, you prefer quick, filling dinners. 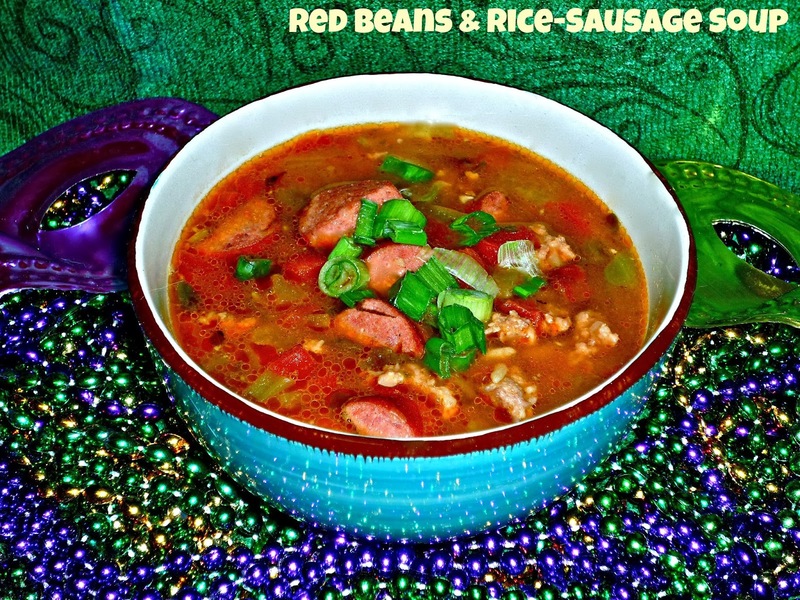 My Red Beans & Rice-Sausage soup is built around a package of spicy red beans and rice mix, and it's ready in under an hour. With the addition of two kinds of sausage, it cooks up thick and rich, with a smoky-spicy flavor that will knock your socks off! I was thrilled to find a recipe for Andouille Red Bean Soup at the Zatarains website. I tweaked their recipe to suit our tastes and whipped up a pot of this hearty, delicious soup. I used a combination of smoked sausage and browned bulk pork sausage, subbed low-sodium chicken stock for water, and added a can of petite diced tomatoes instead of corn since that's what I had on hand. This recipe made enough for four large bowls of soup -- along with a container leftover to freeze for us to enjoy for dinner on a particular busy evening. That makes this soup a sure-fire winner! Step 1: Heat a Dutch oven over med-high heat. Add the olive oil and the two sausages. Cook until the sausages are browned. Add the onion, bell pepper, and celery. Sautee until the veggies are softened and translucent, about 5 minutes. Everyone who tries this soup just loves it! It's thick and hearty, with a nice smoky flavor from the red beans and rice mix and the sausage. The consistency was perfect, and we thought the amount of spice was spot on. If you prefer your food milder, feel free to leave out the hot sauce. If you like it on the spicier end (like Michael does), simply add extra hot sauce to taste. The perfect partner for this soup is hot buttered cornbread -- or crusty French bread.